From London Waterloo, there are hourly trains to Alton. For further details on train times please visit the National Rail Enquiries website. From M25 Junction 10, A3 Guildford bypass, A31 Farnham & Alton bypass. Turn off left at A31/32 junction roundabout to Chawton and follow the brown tourist signs. 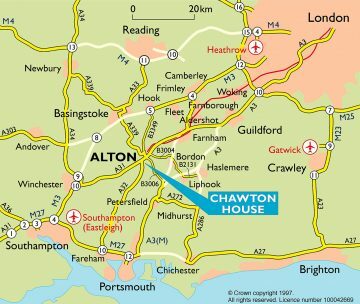 From M25 Junction 12, M3 to Junction 5, B3349 to Odiham and Alton, follow signs for Chawton. The number 64 Stagecoach service runs daily between Alton train station and Winchester, stopping at the A31/32 junction roundabout near Chawton. For further details on bus times, please visit the Stagecoach website. On the 1st Sunday of each month between May and October inclusively the Medstead Depot Omnibus Group run a free bus service between Alton station and Chawton, stopping outside Jane Austen’s House Museum. These vintage buses are part of the Working Omnibus Museum Project charity. The service is funded by the owners of the buses and is open to anyone wishing to travel without any need for a rail ticket or any other form of payment. To see the schedule, click here. 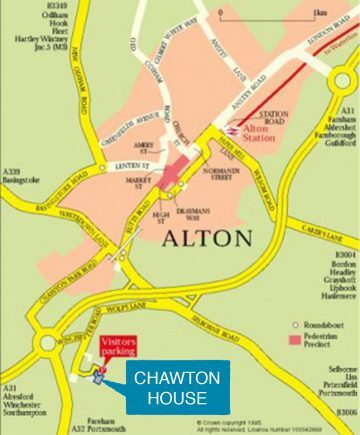 There is also coach parking in the nearby town of Alton. For more information please click here.